IMPORTANT - Restrictions on use Please ask first. No training. DO NOT fly south of the deep gully below Black Crags unless on approach to L3. No dogs allowed onto the site or fellsides. Given suitable light to moderate conditions this is a superb place to fly. The area is off to the north of the main A595(T) halfway between Whicham and the A5093 junction to Millom. Approach from a lay-by on the left of the road (if heading west) near the entrance to Beckside farm. then up onto the hillside before heading back south. If its light worth walking up to the right side of the bowl higher up. Please go through the formality of asking permission first and checking that a landing field is available. Hallbeck House; the farmer farms at Beck Side farm. Field L3 can be used for bottom landing if preferred; check first at Parsonage Farm - usually a field in the valley out from take off will be suggested. There can be rotor along the summit above the crags. The site is very prone to sea breeze in summer whereby the wind shifts rapidly to the south. Top landing areas are good although watch the wind gradient. Check out the landing fields; some of them slope slightly. Beware of the wind gradient and possible problems with pushing forward over the upper slopes. See HG information. Quite a stiff carry up! There are no known vices but the site is little flown. The area is occasionally used by gliders aero-towed across from Walney. A number of top landing areas are available at different heights from the summit down. The site lies at the very western edge of the Lake District area and so has the potential to produce tremendous cross country distances. However, XC potential in an easterly is not brilliant as there is airspace downwind at both Eskmeals and at Sellafield. The Irish Sea might come into the equation as well. To go XC it might help to try to head north as much as possible. Flights to Whitehaven and Keswick have been done. No photos available for this site. Good quality photos of CSC sites always required. Notes : A great flight through the Western Lakes. From Black Combe and then up the Duddon Valley. Over Harter Fell and into upper Eskdale. Over the eastern side of Scafell and Great End and into Borrowdale. Down the Maiden Moor ridge. 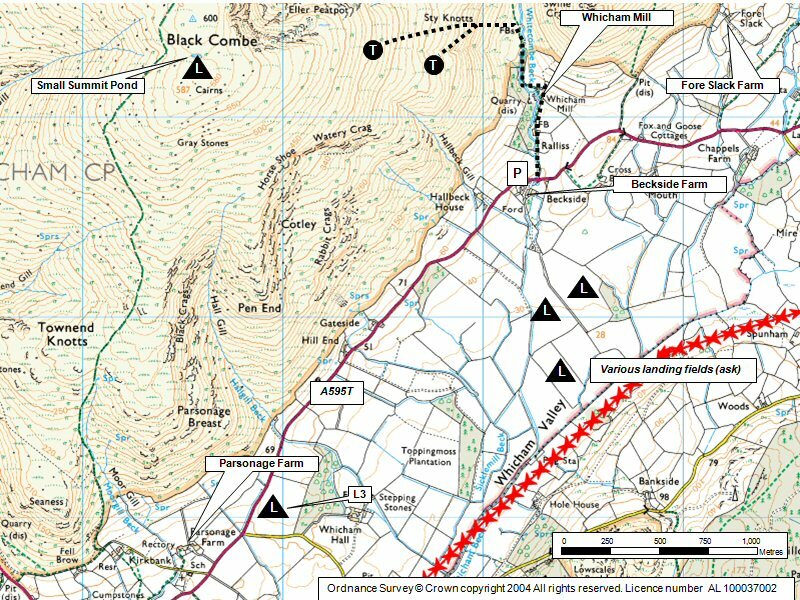 A diversion to Blencathra and then back to the finish north west of Bassenthwaite. Google Street View - Parking Park on the left and then walk up the track on the right of the road. Don't block the farmyard entrance.